Most pre-tournament modelling has been put through the shredder by the eliminations of traditional heavyweights like Germany and Spain. However, the clash of the fancied South Americans and Belgium’s ‘Golden Generation’ has given the most casual of analysts reason to feel smug that, at least, they got one thing right in their scenario plotting. The teams have progressed through different means but each arrives with confidence after rousing wins in their last starts. Inspired by Neymar brilliance and the wiles of Willian, Brazil sent a tough Mexico side packing with a 2-0 defeat that cemented Tite’s side as favourites to claim a record-extending sixth World Cup trophy. It was hardly such smooth sailing for the Belgians, who suffered a huge scare in their last-gasp 3-2 win over Japan. But their marauding finish, banging in three consecutive goals late in the tie to erase a 2-0 deficit, was a sobering reminder of the firepower at Roberto Martinez’s disposal. Against Brazil, however, Belgium’s formidable attack featuring captain Eden Hazard and Romelu Lukaku may be hard pressed to break down a stingy defence which has conceded one goal in their four matches at the tournament, and a total of six from their past 25. Their win over Mexico showed textbook defending from the central pairing of Thiago Silva and Miranda, assisted by full backs Fagner and Filipe Luis. If there is one glimmer of hope for Belgium, it might be the suspension of holding midfielder Casemiro, who picked up his second yellow card during the Mexico game. The Real Madrid man has been key to Brazil’s structure, so his likely replacement, the 33-year-old Fernandinho of Manchester City, will have big shoes to fill. Although Luis put in a solid display against Mexico, Tite may be tempted to recall his preferred left back Marcelo, who missed the match with a back injury but returned to training. At the other end, Brazil’s attack has clicked after a disappointing start to the tournament, and even Neymar’s much-criticised histrionics could not completely overshadow a dominant performance against Mexico. They will look to exploit a Belgium defence that has let through four goals and has a trio of big centre backs that may be exposed for pace by the nippy Neymar, Willian and Philippe Coutinho. Belgium, bidding to reach their first semi-finals since 1986 in Mexico, face a huge challenge to knock off Tite’s men but after surviving Japan, they already feel they are playing with house money. “We can enjoy it from the first minute,” Martinez said. The winner will bid for a place in the final against either France or Uruguay. The post Survivors Belgium brace for Brazil challenge appeared first on SABC News – Breaking news, special reports, world, business, sport coverage of all South African current events. Africa's news leader..
World Cup hosts Russia were outsiders only weeks ago but their unexpected World Cup success has made them hungry for more as they eye a semi-final spot against Croatia, defender Ilya Kutepov said on Wednesday. Russia edged Spain on penalties in last week’s round of 16 match after the Spaniards played more than 1,000 passes but failed to create any chances. Kutepov, who has so far played every minute of their four matches, said his team was now allowed to dream big. Since the end of the Soviet Union, which had reached the last four in 1966, Russia have never advanced as far as they have done in their home tournament. That will require different tactics than the ones deployed against Spain where Russia sat back and soaked up the pressure with the Spaniards dominating possession but lacking a clinical edge in front of goal. “We all understood that Spain will control the ball, it happens in every match they play with any team,” midfielder Aleksandr Golovin was quoted by Match TV as saying. Russia face Croatia at Sochi’s Fisht Stadium on Saturday and the winner will play either England or Sweden for a spot in the July 15 final in Moscow. “If the team has less control of the ball it doesn’t mean they are weaker,” Golovin said. “That’s just another style of play. They don’t aim to control the ball for the whole match, they aim to achieve a favourable result. From this point of view – it’s easier. The post World Cup success is becoming an addiction says Russia’s Kutepov appeared first on SABC News – Breaking news, special reports, world, business, sport coverage of all South African current events. Africa's news leader.. 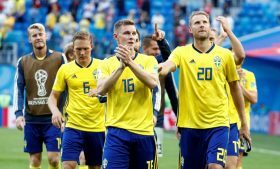 The post Analysis: Swedes steam into last eight with big names in their wake appeared first on SABC News – Breaking news, special reports, world, business, sport coverage of all South African current events. Africa's news leader..